Web-based tool, networking of biobanks for personalized medicine, metabiobank, provision of trans-institutional and trans-national access to biobanks. p-BioSPRE is a metabiobank providing trans-institutional and transnational access to biobanks (Figure 1) while safeguarding patients’ privacy and full biobank autonomy . The p-BioSPRE architecture is based on modular CRIP tools and concepts (a metadata-driven, scalable, and robust system of relational databases with an xml-based query interface) . It mirrors the hub-and-spokes structure proposed by BBMRI for national and international biobank networks. Contrary to biobank registries and catalogs, p-BioSPRE allows for up-to-date queries on a case-by-case and specimen-by-specimen basis. It caters to both: researchers looking for well-annotated human specimens from all disease areas and biobank operators conveniently offering donated specimens and data for research. p-BioSPRE is in line with the BBMRI requirements for data integration systems and the p-medicine security framework. Its central infrastructure is maintained by Fraunhofer. 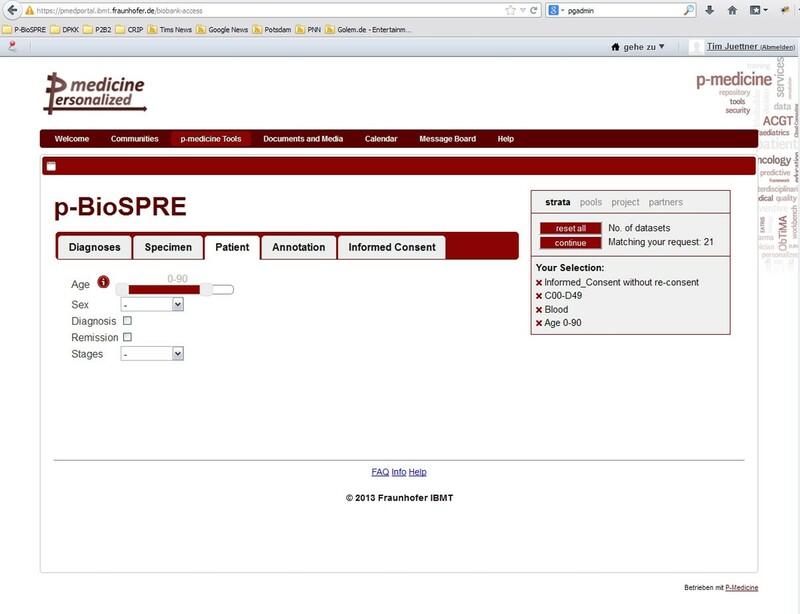 Access to the operative version of p-BioSPRE is restricted to p-medicine partners. The test and demo version 0.6 is on-line (links below) since May 23, 2014. Evaluation of p-BioSPRE by p-medicine clinical partners is ongoing until 2015. Researchers looking for stratified human specimens. Biobank operators looking for projects and partners to make use of donated specimens and data.